Tomatoes, turnips, and onions dominate the portion of our modest veggie garden this year. In this photo, there are some peas and beets hidden from view behind the tomato plants. This particular garden patch is planted in an area between the house and the street. 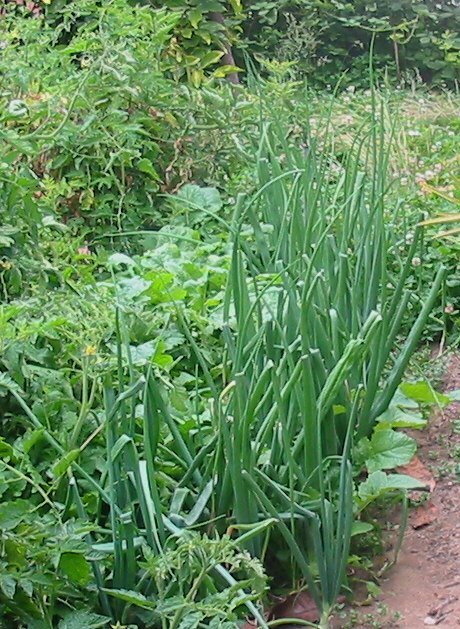 Additional veggies, including leek, radishes, and more onions, have been planted in the garden behind the house, but their tiny sproutlings are not yet ready for prime time display.